We’re branching out into weekdays! 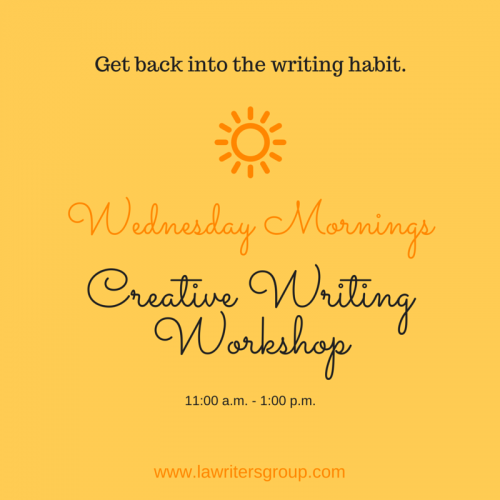 Announcing our newest ongoing writing workshop, Wednesday Morning Writing Workshops. Our Sunday Creative Writing Workshops have been such a hit, we want to bring the inspiration to your weekday. Every other Wednesday from 11:00 a.m. to 1:00 p.m., Los Angeles Writers Group offers a creative writing workshop where you can show up and write for 2 hours based on creative writing prompts. Create, share (or don’t – no pressure! ), and discuss the writing life and process. You’ll leave with new writing, new ideas, and the inspiration to continue this work. Writing exercises are based on the needs of the group, on sheer creativity, and to encourage you to write what you may not have otherwise written. 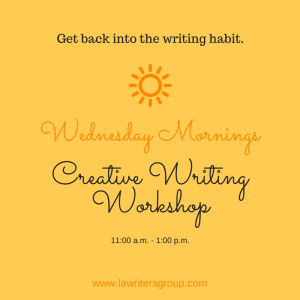 Click here to learn more about or register for our Wednesday Morning Writing Workshops.